The Voice Season 13 returns with Top 11 artists live performance tonight, Monday, November 27, 2017 on NBC. Tonight, the remaining Top 11 artist will perform for your votes, with the results following on Tuesday. Stepping on The Voice stage tonight are Adam Cunningham and Addison Agen from Team Adam; Davon Fleming, Shi’Ann Jones and Noah Mac from Team JHud. Red Marlow, Chloe Kohanski and Keisha Renee from Team Blake; Brooke Simpson, Ashland Craft and Janice Freeman from Team Miley. Last week, Jon Mero from Team Adam was sent home. He was eliminated after receiving the lowest number of votes from the public. Keep locked on this page, The Voice 2017 Top 11 live performance show recap and videos will be posted on this page once available online. 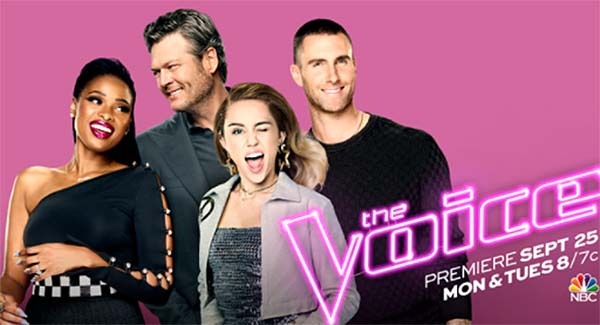 The Voice airs tonight on NBC at 8/7c with Adam Levine, Blake Shelton, Jennifer Hudson and Miley Cyrus as judges and Carson Daly as host.